The RD-MV100 Series has been discontinued. Please see the RD9900 Series as a possible alternative or contact our Data Acquisition Engineering Department. (simultaneous display of all channels possible) Displays the scale values and engineering unit for each channel and arbitrary messages, along with the waveforms. The orientation (vertical/ horizontal) of the trend display and background color (white/black) can be switched. The fastest trend display update rate is 15 sec/div (approximately 2376 mm/h in terms of display speed) for a 125-ms measurement interval model. Displays channels/tag numbers, engineering units, and each channel's alarm status, as well as the measurement values. The fastest display update interval is 1 second. 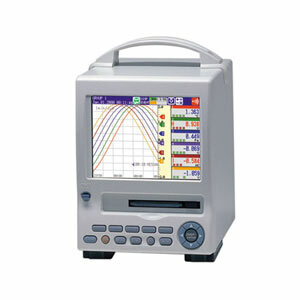 The RD-MV100/200 saves measurement data in internal memory. Data in internal memory can also be transferred to PCs or data servers either online or using a removable storage medium. The measurement data memory consists of nonvolatile flash memory (1.2 MB) that does not require battery backup. This means data written to memory will not be lost due to events such as a power outage. The display data format is used to save data displayed as waveforms. Each time the waveform display is updated, two data values (maximum and minimum values) measured since the previous update are saved. The event data format is used to save all data in a specified data saving interval. Event data can be used in combination with the trigger functions to detect and analyze abnormal data. A pretrigger can also be set, making it possible to analyze data before and after the trigger. Choose from a floppy disk drive, Zip drive, or PCMCIA ATA flash memory card slot. The RD-MV100/RD-MV200 can easily be connected directly to a PC, even without using general communication protocols such as GP-IB and RS-232-C. Use a cross Ethernet cable for a one-to-one connection. 참고: Standard units include floppy disk storage, 120/240 Vac power, 3-pin power inlet with UL/CSA cable, clamp input terminals, and complete operator’s manual. To order Zip disk or ATA flash card change the “-1” to “-2” or “-3” respectively and add $166. To order with 12 Vdc power input (includes AC adaptor), add suffix “-2” to model number and add $386. To order with different power cord add suffix “-F” for VDE, “-R” for SAA, or “-S” for BS cable to model number. No additional cost.